Among sport cruisers designed by Beneteau, the Gran Turismo 50 speaks for itself. Elegance, technology and spacious deck all combined together makes this boat one of its kind. A sporty exterior and luxurious interior is the right definition for this yacht. A large number of windows provide sufficient natural light to the interior making it bright and inviting. The classic walnut woodwork detailing throughout the interior adds a modern touch to the entire design. 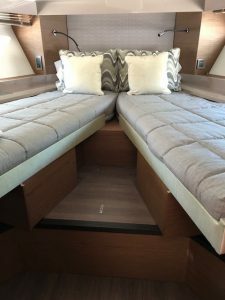 It was quite fun to design bedding for the staterooms for this particular GT50. We used a mix of our Twilight Package, quilted silken coverlet in silver and Sunbrella throw pillows in the salon. A great mix of modern neutral tones. The designer maintained the unity of the design by using the same family of greys and browns throughout and adds the element of variety by using just the right amount of pattern in throw pillows resulting in a very harmonious design! You see our custom quilted coverlets with neat box quilting in the images here. Our quilted coverlets are perfect for keeping your stateroom looking tidy and are a breeze while making the bed. 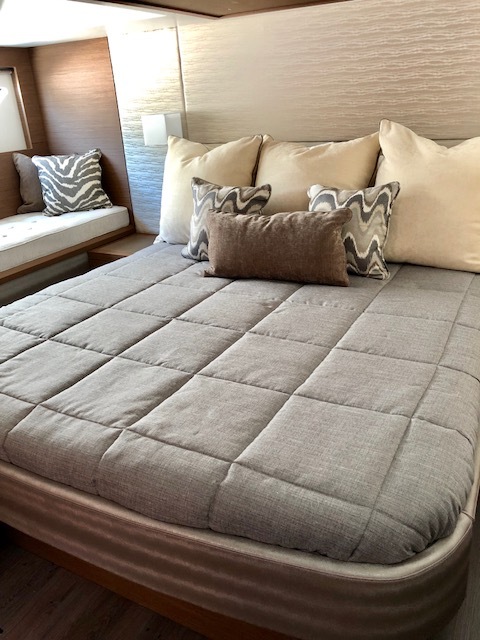 Our coverlets fit the size of your bed, are quilted with a medium weight batting, have a piping trim edge and a drop to give a beautiful custom look. You can view our entire collection of house fabrics on our website. We also carry Sunbrella fabrics as it works great for marine environment and is mold and mildew resistant, water repellant and fade resistant. Contact us if you are interested in viewing our sunbrella collection and we will be happy to walk you through. As I mentioned earlier, we used a mix of our Twilight package here for this client. Visit our website and view the Best-Selling Bedding Packages on our home page and you will find everything you desire right there. Our designer has combined our best-selling fabrics and patterns in classic and modern palettes all ready for you to pick from. There is a wide variety there, something for everyone. 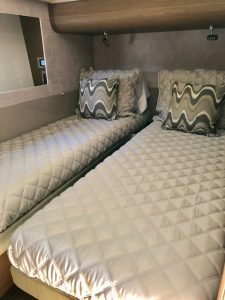 At yachtbedding.com, our goal is to fulfill your desires to get the stateroom of your dream and we make the process super simple and smooth for you. Feel free to contact us and our design team will be more than happy to walk you through it.